Ingredients: Aqueous In-fusion of Panax Ginseng Extract, AHA Liposomes (Lactic Acid, Glycolic Acid, Hydroxylated Lecithin,Cetrimonium Chloride, Cholesterol, Tocopherol Acetate), DI-C12-13 Alkyl Tartrate, Vaccinium Myrtillus (Bilberry) Extract, Saccharum Officinarum (Sugar Cane) Extract, Acer Saccharum (Sugar Maple) Extract, Citrus Aurantium Dulcis (Orange) Fruit Extract, Citrus Medica Limonum (Lemon) Fruit Extract, Ceteareth-5, Cyclomethicone, PPG-12/SMDI Copolymer, Phenyl Trimethicone, Glycerin, Squalene, Carthamus Tinctorius (Safflower) Oil, Dimethicone, Glyceryl Stearate, Peg-100 Stearate, Helianthus Annuus (Sunflower) Seed Oil, Behentrimonium Methosulfate, Cetearyl Alcohol, Magnesium Aluminum Silicate, Salicylic Acid, Saccharomyces Cerevisiae (Yeast) Extract, Xanthan Gum, Camellia Oleifera (Green Tea) Leaf Extract, Tocopherol, Chlorella Vulgaris (Algae) Extract, Sodium Hyaluronate, Camellia Sinensis (Green Tea) Extract, Vegetable Oil, Beta Carotene, Macrocystis Pyrifera (Kelp) Extract, Ascorbic Acid, Potassium Sorbate, Nylon-12, Phenoxyethanol, Fragrance (Parfum). I purchased this product not too long ago while searching for a product that could help my oily and uneven skin. This product is amazing! I haven't broken out from it and my skin tolerates it well. I didn't go through any peeling or stinging. It really helps keep my skin clear of acne and it has improved the texture of skin tremendously. 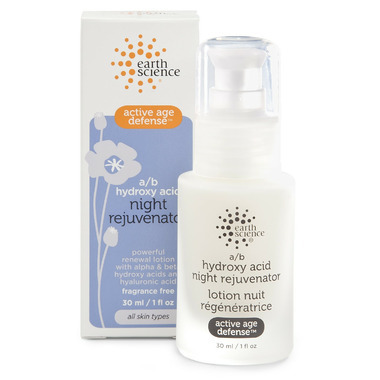 I don't use it every night although I think my skin could handle it (I use it about 3 times a week and I interchange with other products and it seems to be fine). I hope they never change their formula because this product is amazing! I use it daily, have for a few years now. Excellent product. I just love this product. It leaves my 60 year old skin really soft and smooth. It would be helpful to have more information regarding the frequency and duration of use as it says on the box that it should not be used all the time. A little on the oily side, but my skin tolerates alpha hydroxy products very well,there is no burning or stinging after using this cream and I use it almost every night , my skin already looks so much better and my make up goes on smoother. Will repurchase. This does exactly what is promised. Excellent product, very effective. Will buy this again. Love this night cream! It was recommended on the Dr.Oz show as an affordable and effective cream. I wake up to glowing skin with this cream. It is also fragrance free and does not aggravate my sensitive skin. That says a lot! Be sure to wear sunscreen during the day after apply this cream as your skin will be sun sensitive. Great product. I have very oily somewhat sensitive skin and was having trouble finding a product that didn't cause acne. This stuff is great. Haven't had a major breakout in over a month. Stings a little if u wash your face and then put it on but it doesn't last so it's not a problem just a heads up for those of u trying it for the first time. Just bought another bottle! I have been using this product for a year now and had decided to switch to something cheaper. What a mistake!! This is a great product that is not too heavy or too light. It has definitely improved by skins complexion. I use it every night and it doesn't irritate my sensitive skin at all. I am approaching 40 and it seems to really be working well with fighting the signs of aging. I won't be switching again! Has no odour, doesn't burn but I only use it once a week and very lightly. Seems to work. Really works to brighten skin. It burns a bit when I put it on, but I have very sensitive skin. And, like any product in this vein, sunscreen is a must. I alternate this with my retinol cream at night. This is truly a great product. I have been using it for the past 6 weeks and I can honestly say the great reviews are well deserved. It leaves your skin feeling and looking noticeably softer, and smoother and the price is far more reasonable than other comparable brands. I noticed a difference after just one night of use and was very surprised and pleased. Iâ€™m 28 years old and not particularly concerned with anti-aging products considering Iâ€™m often told I look under 18 still but even I must admit my skin looks even younger. I have acne-prone oily skin and this cream has not caused a single breakout. My dermatologist recommended using an AHA cream to help with my acne (acne-prone skin is less efficient at shedding dead skin which leads to easier clogging of pores). Using this cream along with tea tree oil toner has cleared up my acne and helped to fade dark spots faster. This product gives my skin a nice glow, looks refreshed. It tingles slightly, not bothersome. Provides good moisture. I have been using this product for over a year now. I use it almost every night- one day a week I use a vitamin A cream. It absorbs quickly, not too greasy and has done wonders for my skin. My skin definitely has a more even complexion and feels smoother. I would definitely give this a buy! Absorbs quickly and little smell. Like the pump. Disappointed to read label on bottle warns to not use on a regular basis and stay out of sun when wearing this product. It stings on my face for a few seconds after using it. I bought it to use every night but have stopped and just use it a couple times a week instead. Was looking for a heavier night time moisturizer. I gave 3 stars due to the poor product description. This product is great. It is light and goes on easily. Leaves my skin feeling and looking better than any other product ever has and I am now 59 years old. Will definitely be purchasing again. I have spent hundreds of dollars on face creams, only to be disappointed. This one may not be the ultimate but it's better than anything i have ever used. My skin looks more supple and it feels great.I would definately buy this one again. Leaves skin feeling silky. Good for brightening dull skin. Highly recommended. I've been using the product for about a month now and love it. I saw results from the beginning and am still really happy after 4 weeks. It's very gentle on my sensitive skin and my skin looks glowing with tighter pores the next morning, I've noticed fewer blemishes and have even noticed old blemish marks fading. I also love that I only have to use 2 pumps to cover my face and neck. Plus, it has great packing as well; the pump is my preference over open jars. Very effective product. You can feel the difference the next morning. The skin is glowing, pores are tightened, and I notice that I get fewer blemishes/pimples. Good product at a good price ! Wow! I'm really glad I found this natural and efficient product for this price! I switch between vegecell by Aubrey Organics to this one containing lots of fruit acids. It smells great and tingles a little when you first apply it so you know it's working at removing the dead skin cells!